Idea Factory is a leader company in iPhone Development. 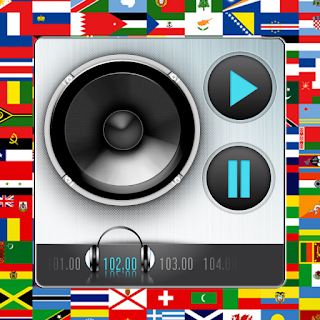 Our new app WR Mundi Radio is already on AppStore. Now you can have all radio stations from all around the world on one single app. For a limited time it is only US$ 2.99. We use our own Radio Station List Data Base. If we don't have the radio you would like, just send an email to us and we will try to add it to our DB. This app is targeted for those who often wonder if the door of the house is closed or who tends to forget the cellphone at home. To start use it just add a reminder. If you want to be warned when you hadn't check the reminder on time just set a notification and choose the week days and hour that you want to be advised. If you are a busy person and use to forget those things that have to be done every single day...then just get this app and don't forget your head again! Atention: Once your registration is over you will receive a code. Other users will only be able to find you and send you messages if you give them this code. At any time you can choose if you want to send your coordinates just by turning the switch ON or OFF. You can see a accuracy bar with three values. This means that once a new coordinate is estimated your exact location could be in a radius either of 100, 1000 or 3000 meters. (Choosing small values for accuracy will increase the time to estimate your position). On this mode you can set a timer. 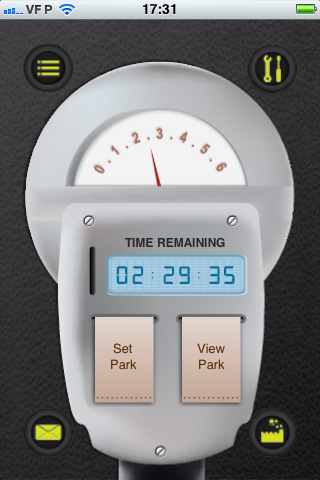 Once this timer is reached a new coordinate is estimated. By default it will be every 20 minutes. Selecting this option means that your position is only estimated if someone is looking for you. Once you receive a push notification and if you choose to "View", a new coordinate will be determined. This only works if you choose the normal mode. When you close or let you device enter in suspension mode the geolocation services will remain active. Atention: If you allow your device to keep estimating your position in background it will have an impact in your battery. To add someone to your list (so you can track him/her), just click on "+" located on the top right corner. After that, you will have a screen as shown below. Just fill out the name, email and code fields. The code is a number that the person you want to track received when he or she finished the registration process. At any time you can delete someone of your list just by scrolling to the right over that person name and pressing "Delete"
Tap on the person you want to find. You will see two buttons on the bottom. Tap on the one with the map. 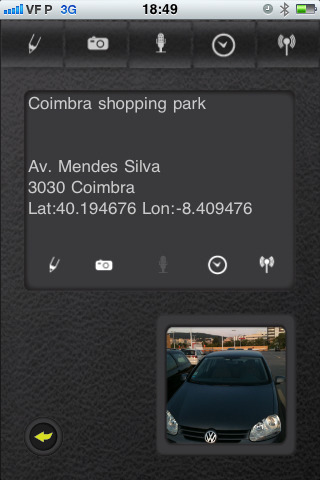 The app will display the screen below with the person location. -Date and hour of the last estimated position. On the top right corner you can see a refresh button. Pressing it allows you to see if a new position was determined. This app also gives you the possibility to chat with your kids! When you send a message to your kid he will get a push notification warning him that he has a new message from you. Wouldn't it be great to to attach a voice memo or photos to your text message? With Track Your Kids you can do that! You can record and send a sound (maximum of 60 sec). Take a picture and send it. When you register you will get a subscription. You can see your expiration date on the top right corner of the login menu. On the bottom of the view you can see several buttons. If you tap on the $ you can buy a new subscription for a year or six months. On the Configurations, clique on the right-below tab, as indicated on this screen. We hope that this tutorial has been useful. If you want to contact us please send us an email. eAnniversary - Because your life is full of important dates! eAnniversary is an iPhone/iPod app that allows you to save and track birthdays and anniversaries. This app came with features to remember you and to congratulate those who's birthdays. Now we will show you how all this work. The first screen (list screen) is where you can see all the birthdays and anniversaries that have been added (just touch the respective tab). It has a bottom bar with several buttons and a top bar with an add button. If you touch at this one you'll go to the Add screen and here you can add a new event (birthday or anniversary). To add an event you must fill the name and date fields. After you have filled the event data you can set "alerts" to warn you or you can set "congratulate" to congratulate the one who's birthday at a specified date. Before we explain those features lets go back to the list screen. Now you can see that we already have an birthday in our list screen. Before we do anything else lets look at the Config screen to see what we can configure. You can also set the sort order of the events by the parameter you want. At the Login configuration you can perform a login, if you don't have one you can add a New User. You have to be logged if you want to use the server side features (Alert and Congratulate) or to buy an inApp product (we will explain this later). The Share configuration is where you set your Gmail login to be allowed to add your eAnniversary events in your Gmail Calendar (sync feature). Lets go back to the List screen and select an event. In the top bar is a double arrow that is pointing to bottom. If you touch it you'll see a bar with a trash and a pencil icons. The trash button will delete the event and the pencil button will lead you to the Edit Event screen. In the bottom bar lets touch the Alert button. The Alert screen has three features, SMS, E-Mail and Push notifications. The SMS feature have a number which indicates the number of SMS that you have bought in the eAnniversary inApp Store. If you hadn't bought anyone or you aren't logged, this value will be zero and you wouldn't be able to program SMS sending. If you have SMS to spend then you can program the eAnniversary to send you a message on the date you have set. You can also choose if you want it to repeat yearly, monthly or never repeat. The SMS will be sent from our server. The E-Mail feature is free but you need to be logged to use it. This feature will sent you an email on the date you have set. The e-mail will be sent from our server. The Push notification is also free and you don't need to be logged. This feature will send to your iPhone/iPod a notification with the message you have wrote at the date you have set. The PUSH Notification only works if you have iOS4. Look again to the bottom bar and touch the Congratulate button. Here you have two tabs, the "Now" and the "Schedule". The difference between this two menus is that in the first one you congratulate the person now, i.e, you don't program any date to congratulate in the future. The second one (Schedule) it's for those congratulations that you want to program to be in a particular day and you can set it to repeat in the future. Let's first talk about the "Now" Menu. The Call feature will open the iPhone phone app with the phone number of the person. You can use the Call feature without being logged. The SMS feature will open the iPhone Message app, i.e., it wouldn't use the SMS from the inApp. If you sent an SMS from here it will cost according to your iPhone plan, it has nothing to do with your login data and the packs you had bought in inApp. You can use this feature without being logged. The E-Mail feature will open the email screen and it will be sent now. To use this feature you don't have to be logged. The E-Cards feature is the only one that only works if you are logged and if you have bought an E-Card pack in the inApp store. Here you can choose the postcard you want to send and the message. You can see the preview to look how it would be. The E-Card will be sent now, if you have E-Cards to spent. The E-Card is sent from our server. The Twitter and Facebook features allows you to post in your wall messages to your friends. Touch in the "Schedule" tab and you can see three features, SMS, E-Cards and E-Mail. Like was told, the main propose of this features is to program a congratulation to be sent at specified date and be (or not be) repeated. To use one of this three features you need to be logged. The SMS feature at this menu works like in the Alert menu, it's required to have bought a SMS pack in the eAnniversary inApp Store. Then, if you have SMS to spent you can set the phone number, message and date when to send the message. It can also be repeated yearly, monthly or never. It will repeat only if at the sent date you have SMS to spent. The SMS will be sent from our server. The E-Cards feature works basically like the SMS feature. It's required to have bought an E-Card pack in the eAnniversary inApp Store. Then, if you have E-Cards to spent you can set the postacard, email, message and date when to send the e-card. It can also be repeated yearly, monthly or never. It will repeat only if at the sent date you have E-Cards to spent. The E-Cards will be sent from our server. The E-Mail is free, you only have to be logged. At this feature you can set the email, message and date when to send it. It can be repeated yearly, monthly or never and also for free. The e-mail will be sent from our server. Lets go back to the List screen and then touch in the Calendar tab at the bottom bar. In the Calendar screen you can see the events organized by month. You can navigate in the calendar touching those arrows in the blue top bar. The Add button in the brown top bar allows you to add an event with the date pre-field as the first day of the month and year you are in the calendar. Selecting an event will lead you to the main screen of that event. It's like if you had touch in the event on the List screen. Touch in the Sync button at the bottom bar to go to the Sync screen. At this screen you have four different features. The first one, "Send to GoogleCalendar", as it is named, it will insert in your GoogleCalendar the events you have inserted in eAnniversary. To use this feature you must have logged in the Config->Share->GoogleCalendar. The "Export to E-Mail" will export a file in csv format with all your events to your email. The "Backup in Server" will send to our servers all your eAnniversary data to allows you to recover later. To use this service you need to be logged and you have to buy the Backup subscription at the eAnniversary inApp Store. Every time you buy a new subscription, that time is added to the time you already have bought. While you have "Backup time" you can backup and recover your data whenever you want to. The "Sync AddressBook" allows you to sync all your contacts from your Contacts Book to eAnniversary. A contact will be added only if it has birthdate. What remains now is to explain the inApp Store. Touch in the inApp Store button at the bottom bar. If you don't have the In-App Purchases enable you would not be able to open it. To enable the In-App Purchases go to Settings->General->Restrictions. At this screen you have all the packs you can buy and you have also the purchase and consume history of your products. To use this features you need to be logged. If you want to contact us please send an email to us. We provide some videos too. It is now for sale the new version of eCarPark Pro! get the directions that will guide you to your car. This feature will open the Maps app with your location and your car location marked and show the route that you should do if you are going by car, bus or walking. - people who park in big open parking. - people who park inside a building. 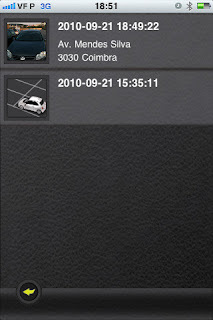 On an open parking, you can save the geo location and if you have an iPhone 3GS or iPhone 4, the app will use the compass feature of the iPhone to show you if you are heading to the right direction. If you have iPhone 3G, the app will calculate your movement in the park to show an arrow pointing to the direction you are heading. In iPod you will not have this feature, since its geolocation is far less accurate. 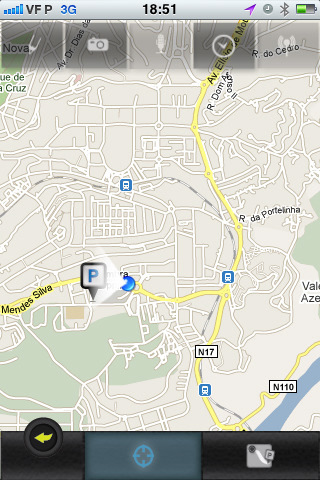 In the second case, you don't have to use geolocation, since you are inside a building. 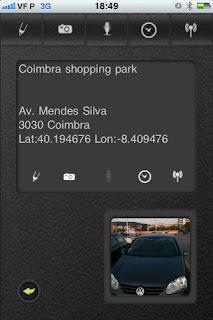 You can use all other features without having to wait to get a geo location signal. You can set a push notification to be alerted when the time expires. You can choose what information you want to save in each park. This app uses augmented reality to show where your car is related to where you are at this moment. Works best on iPhone 3GS and iPhone 4. But even on iPhone 3G, the app will use your deslocation to show an arrow heading to the direction you are moving to. You can save several parks and revisit any old one. It is very useful if you are on a foreign country! The WR Radios serie has a new version 1.7. Now you can see the Radio Name, City and Bitrate on Radio Stations screen. 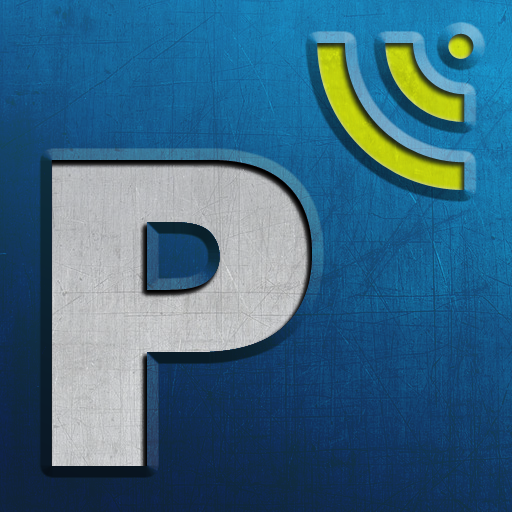 We have a new app waiting for Apple approval. Remember. Normaly in twitter you can post only text. But with this app you can now send pictures. It will send the picture to an Internet Server and then post the link on twitter. All our customers have FREE support by e-mail. Including customers of our free apps. Any bug reported we will try to fix it in the following 48 hours.